"Wax" and "shellac" are terms we still associate in popular language with phonograph records. But not only has wax vanished as a medium for the actual cutting of records; shellac, too, is almost gone in favor of the new synthetic plastic products. For that matter, no record was ever made of pure shellac. 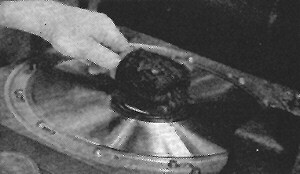 The old-stlye 78rpm "shellac" record was made of a molding material that we now call a thermoplastic ("melts with heat"), in which shellac was greatly extended by assorted neutral filler materials, among them the carbon black which gives the black look to most records. Formulas for record material were and still are highly controversial and highly variable-quiet surface, hardness, resistance to breakage, and other features being more or less at odds with each other. Whatever a record material is compounded of, it must be both hard and smooth in the cold state, and capable of melting or softening to the proper degree with heat. Pure shellac would never do. It would be as brittle as so much thin glass. Yes, record shellac is indeed the same material as the shellac we find in the familiar varnish. Shellac-or "lac," its more correct name - is a natural resin, not unlike the gummy substance found hereabouts on fir and pine trees. Its source, however, is the Far East, where the female of a small bug that infests certain trees of sorts unknown in the West, coats itself for protection with the gummy stuff. Ground-up insects constitute a goo part of the first shellac product, but various stages of purification are represented by our orange and white shellacs, which are no more than simple alcohol solutions of lac. This same substance serves as a binder for the assorted ground-up an powdered fillers that have made up various phonograph record materials these many years, the percentage varying according to the formula. An interesting economic situation has arisen due to the geographical location of the lac-producing bug and its special tree largely within what was the British Empire before Indian independence. Britain controlled the world supply of lac, and all phonograph records made outside the Empire depended British exports. It is no coincidence, then, that English shellac records have long been known as the finest made. Whether more shellac was used than in other formulae is a question; better grades of lac (which, being a natural product, cannot be absolutely standardized to one grade) are more likely the answer, since the optimum percentage is not very high. Much of a shellac records quality was also due to the degree of uniformity and fineness of grain of the neutral filler or extender that was bound together by the lac. Today, though millions of so-called "shellac" records are still to be found in the stores in this country, a large number of them contain no natural shellac at all! Instead, the binding material - mind you, this in what seems to be the old-fashioned "breakable" record - is that modern wonder, vinylite, a synthetic resin plastic made in the United States by the company that developed the first important thermosetting plastic, bakelite, almost half a century ago. Now the British must buy vinylite from the United States. The present-day American "shellac" record is a part-vinylite disk, the extender, including the traditional ultra-fine powder, carbon black, being much as it always was, the binding material vinylite instead of lac. The new plastic "unbreakable" records are also vinylite-made. Unlike natural lac, this new plastic is flexible, yet strong and hard enough to be used pure as a material for record making. Pure vinylite is not cheap, and, strangely enough, a certain amount of cheap extender or fill mixed with the pure product produces a record claimed to be even better than one made with vinylite alone. Just how far the addition of other material should be carried for best results and what materials should be used (discarded records ground into powder, for instance) are matters for complex economic calculation. The majority of top-quality LP records, shiny black in color, long-wearing, flexible, are made with a large percentage of vinylite, but significantly less than one hundred per cent. Many fine records are made of the pure product, dyed red for looks, as are many radio transcriptions - not a little of the appeal being in its attractive appearance, its window-clear transparency. But the simple fact is that today we are buying records that vary from the pure vinylite type, always transparent often colored, through dozens of formulae containing less and less plastic, more and more of the various extenders, until we reach the shellac-less "shellac" record of current popular standard-speed hits and a few remaining classical albums. Since that record is easily comparable to the best of the earlier true shellac disks, it is clear that in this new synthetic plastic we have a material of enormous economic flexibility, adaptable to all sorts of technical and economic requirements in the record field. But let me emphasize strongly that the percentage of vinylite in a record is not the final measure of its value to you. The actual materials used to extend the pure plastic are of very great importance, as is the uniform fineness of grain of those materials. As I've already suggested, a small addition of carefully chosen materials, including the ultra-fine carbon black, actually improves the basic vinylite's properties for record making, and that is why most high quality plastic records are opaque black. Beyond this, while sound quality and/or wearing quality may decrease, the variations are enormous. Each brand must be judged for itself on these bases, and of course, in relation to the price charged and the value of the record's sound. I know of at least one expensive brand of small-company records that uses a material with very decidedly sub-standard wear properties, though the associated hiss when the records are new is barely audible. After the half dozen or so processing steps that occur between the original recording and the final metal negative stamper disk comes the final operation, the making of the actual record. The pressing process is surprisingly simple in operation. The waffle maker comes to mind, and indeed the pressing machine's working parts are not so very much larger than a good, solid waffle iron, though the accompanying complications are something else again. Let's take the home waffle maker as a beginning and do a mental conversion job on it. The basic structure is precisely what is needed for record making - two similar molds, both heated, mounted face to face with a hinge at the rear so that the machine opens up facing you. Enlarge these two molds to record size; provide, instead of the waffle pattern, means to hold two record stamper disks, one below and one above (fastened in by their centers and around the edges), and you have the beginnings of a record press. Waffles cook by electric heat; here we need a major substitution in the form of an elaborate channel system behind each stamper to allow first a sudden heat, using super-heated steam at three hundred degrees, then quick cooling by cold water, all of which must be controlled by the opening and shutting of appropriate valves - and automatically, since no human operator could maintain the exact desired cycle of hot and cold that produces the perfect record. With this we approach the complete, if hypothetical, conversion of waffle iron to record maker. The simplest record to make and the most common is the solid disk, of one homogeneous material all the way through, though the more complex records, such as Columbia's old laminated disk, go through the same presses. Record and label are bonded together in the pressing. The operator of a pressing machine has beside him a hot tray, precisely like a standard hamburger hot plate in a quick lunch, on which he places a dozen or so "biscuits" - rectangular blocks of material, (shellac or vinylite) about half the area and two or three times the thickness of the final record. The biscuits soften up on the hot plate until they are of the consistency of a soggy piece of fried mush, just about movable in one piece, and no more. With the press open like a waffle iron, he deftly makes a sandwich, first a label, then a biscuit, then another label, and lowers the top, waffle-wise. The automatic system then takes over unobtrusively; steam heats and flows the plastic material into every tiny groove; at the predetermined moment it is replaced by water, and the record is instantly hardened. As in a good waffle maker, no sticking occurs. Butter or equivalent is unnecessary. The record is lifted out, and the next one is ready to go in. Incidentally, the occasional reversal of labels on records can easily be understood, since the operator of a pressing machine must put the labels and the biscuit into the press by hand. Nothing is easier than to reach for the wrong pile first, or to put the right pile in the wrong spot in the first place. My wonder in watching these operations was aroused by the positively staggering opportunities confusion that were present - what with dozens, hundreds of piles of labels, biscuits of various sorts, unattached stampers, loaded presses, all of a kind looking more or less alike, and easily interchangeable. Yet in almost every case the right pair of stampers connects with the proper piles of labels and the correct biscuits to produce an acceptable record that reproduces the music it says it will. Drastic mistakes are altogether rare. After coming out of the hot press the newly made record has its ragged edge neatly trimmed by a circular cutting device (something like a revolving can opener) and is then passed on for inspection with hundreds of its mates. If you think that perhaps record companies are less careful than they should be, witness the inspection process for yourself. I took notes on the percentage of records rejected by visual inspection and by actually playing checks, but I won't burden you with these figures. It's enough to say that I am sure I saw almost as many rejected disks as accepted ones - huge bins of rejects - and I also saw the elaborate machinery that reduces these masses of unsatisfactory disks to chunks and then to powder for recycling into more records. Visual inspection is done by workers who look closely at every disk that comes to them on conveyer belts, sorting out duds by the binful. The supplementary playing-out-loud of a sample record every so often catches most faults that may have developed in a stamper before it has pressed too many bad disks. Considering the terrifying possibilities for trouble in this whole mass-production operation, I'd say we consumers were reasonably well protected. Somehow I had always assumed that the new LP and 45 records would have some special plant unto themselves, utterly removed from the old-fashioned processes that turned out "shellac" records. I did not realize what a versatile instrument the record pressing machine is. The required adaptation is all made quite simply (though no doubt the original research and experiment were anything but simple) with existing machinery, and thus 33s, 45s, and 78s can be fabricated cheek-by-jowl all in the same room. The same goes for the "shellac" and plastic records. Just a matter of a different type of biscuit and a different pressing cycle, different heats, and different timings. It is to be taken for granted that microgroove pressing must be more carefully managed than the old 78 groove; it is, in fact, a somewhat slower process per record. In terms of playing time, however, the microgroove LP is far faster in the processing than its equivalent shellac forerunner. Six 78 records that's twelve stampers-to one LP with two stampers. Important savings all along the line, with appropriate economies. The record pressing department is actually a rather quiet and unobtrusive corner of any large record-making plant. The big noise and the big machinery and the big (and dirty) storage and conveyer space are parts of the pre-pressing operations that end in the biscuit. Record material is, except for the infrequent pure vinylite, a mixture of ingredients. The mixing cannot, unfortunately, be done merely by pouring materials together or dissolving them conveniently in a solvent. Grinding is a major operation here - grinding of recycled material, grinding and mixing of new raw material. Heat, huge furnaces, prodigious rollers squashing out tons of half-melted ooze, great cutter wheels that slice acres of hot ooze into convenient rolls or into the ultimate small biscuits, immense heaps of dusty bags, whole bins of smashed and crushed reject disks (flaunting irrelevant tatters of familiar labels-one cringes involuntarily at the sight! ), huge hoppers full of black powder, enormous and earth-shaking mills that grind tons of coarse material down to fine-these elements of a mighty manufacturing process made up the typical large-scale pre-pressing operation. The modest, hand-operated individual record presses are utterly dwarfed. Rejected new records and assorted old ones brought in from outside are a major raw material. Ground up whole, labels and all, they can be used for the insides of laminated records. But for other use the paper labels must be removed, and since this is impractical, the centers are simply stamped out in a big press, the remaining outside doughnut chopped up and then ground down to feed back into the endless production lines. Little seems to be lost.